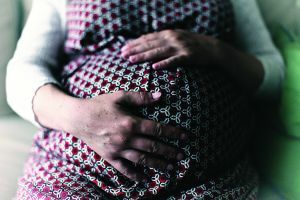 Cooley Dickinson offers several pre- and post-childbirth classes to help you learn parenting basics and connect with others who are on a similar trajectory. 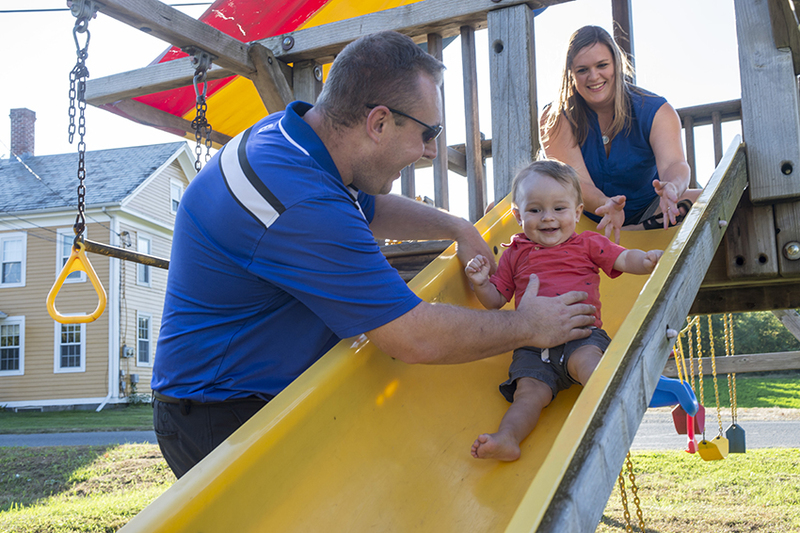 We’ve earned designation as a Baby-Friendly facility by Baby-Friendly USA. Read how this international designation benefits babies and families. Giving birth to a child is an intensely personal experience. We feel privileged that you have chosen – or that you are considering – the Childbirth Center at Cooley Dickinson for this important milestone in your life. Whether you’re expecting a child or simply planning ahead for a pregnancy, we look forward to meeting you. Our team of obstetrician-gynecologists, nurses, pediatricians, certified nurse midwives and support staff are compassionate and nurturing. We sincerely appreciate the opportunity to care for you at this time. We understand that every person preparing for childbirth brings with them a unique set of experiences, values and goals. That’s why we strongly encourage you to take an active role in making decisions about your birthing experience. From creating a birth plan to determining the care for your new baby, your voice will be heard. Our patients appreciate our flexibility and commitment to high-quality care: The Childbirth Center earned first place in the 2016 and 2017 Valley Advocate‘s annual readers’ poll. As part of our philosophy of providing options in childbirth, you have a choice of seeing physicians or midwives for your care. At your first prenatal appointment, you will be asked to select which group you’d like to see throughout your pregnancy. While you may meet only one group during your pregnancy, each member of our team is involved in your care. We work collaboratively to review your options, determine a plan that is best for you and your baby, and ensure your safety and satisfaction. Upon your arrival at the Childbirth Center to deliver your baby, our team will welcome you and your partner or support person. The maternity nursing staff provides a reassuring presence and helps ensure your needs are met. Throughout your stay, your nurse will connect you with important resources as you go through labor and delivery and learn to care for your infant. We strongly encourage quiet time so your new family can get to know each other, including skin-to-skin cuddling and early breastfeeding. In-house board certified pediatricians are available 24 hours a day if your baby needs extra medical attention. Ask us about options for cord blood banking and/or donation. After this initial recovery time, your nurse will continue to encourage that your baby stay with you, unless a medical need arises. Nurses who specialize in maternal newborn care and support are a great resource as you and your baby get to know each other. Board certified lactation consultants are available seven days a week for breastfeeding guidance. During the rest of your stay with us, our nurses will educate you on everything from the safest sleep positions to how to hold, calm, diaper, dress and bathe your baby. Before you go home, your newborn will be given a thorough medical examination, including a hearing screening, jaundice check and newborn metabolic screening. The Goodhinds—Heather and Jason— chose the Childbirth Center at Cooley Dickinson for the birth of their first child in late 2017. Heather says she has always been a person who wants to give back to her community and trust in the services that are provided locally. “We live in Hadley. We want to use the resources we have here,” said Heather, whose husband’s family has farmed the fields of Hadley for four generations and counting. “I think it’s important to trust.” Even before getting pregnant, Heather knew she wanted the nurse midwives to deliver their baby. She says she believes in Cooley Dickinson for a few reasons. “I have worked at Cooley Dickinson since 2016. 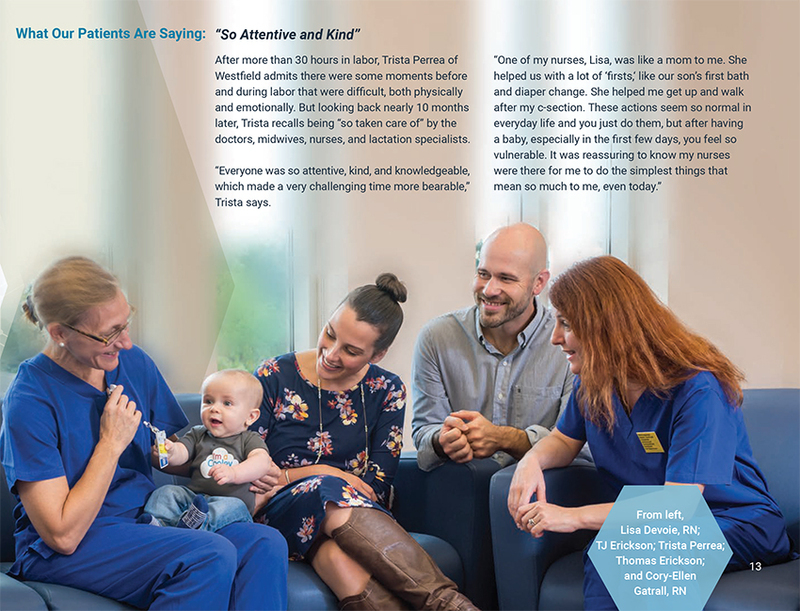 During my time there, I have always been inspired by my co-workers and knew I could entrust them to care for me during one of most important times in my life.” For the Goodhinds, this proved to be true when Heather’s pregnancy and care became challenging. Heather’s pregnancy progressed; she and Jason had a birth plan and thought they knew what to expect. Yet things changed when Heather went to a routine appointment. An elevated blood pressure reading concerned Annie Heath, Heather’s midwife. When the time came to deliver, continued complications meant Heather’s care team recommended a cesarean section. Recently, Heather and Jason returned to the Childbirth Center, with their son Chasen, to meet their new nephew and baby Chasen’s new cousin. “Just to see the nurses again; it was full circle for us,” Heather noted. In the meantime, if expanding their family is in their future, Heather and Jason stand by their first choice. “We would return to the midwives and the Childbirth Center again and again, without a doubt! 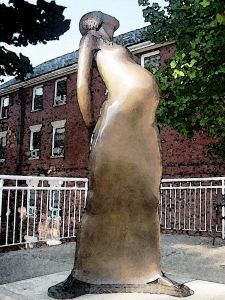 Many people who are pregnant choose to embark on their birthing journey with midwives at their side. Pregnant people and couples interested in pursuing this option for pregnancy and birth can find out more about Cooley Dickinson’s certified nurse midwives, the Midwifery Center and many of our pre- and post-natal educational offerings by visiting our Midwifery Care page. A memorable birthing experience supported by compassionate and caring physicians and certified nurse midwives who guide you every step of the way. 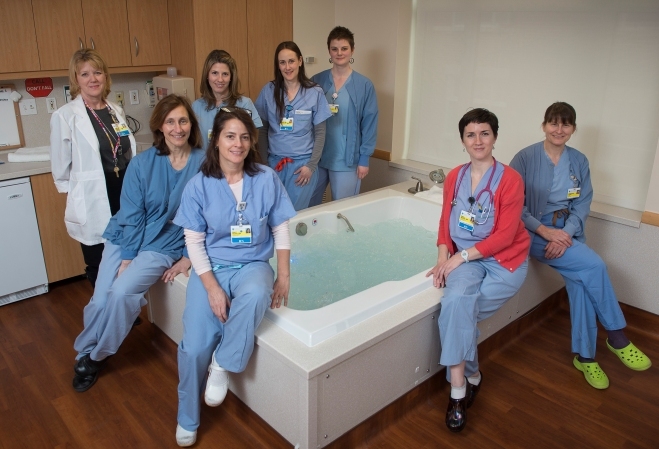 Learn more about the Childbirth Center at Cooley Dickinson Hospital. The Childbirth Center is bright, homelike, and welcoming. We encourage you to create a comfortable environment for yourself here. So go ahead and bring in your laptop (free Wi-Fi is available), play your favorite music, wear your own pajamas, turn on the television: We care about your comfort and peace of mind. 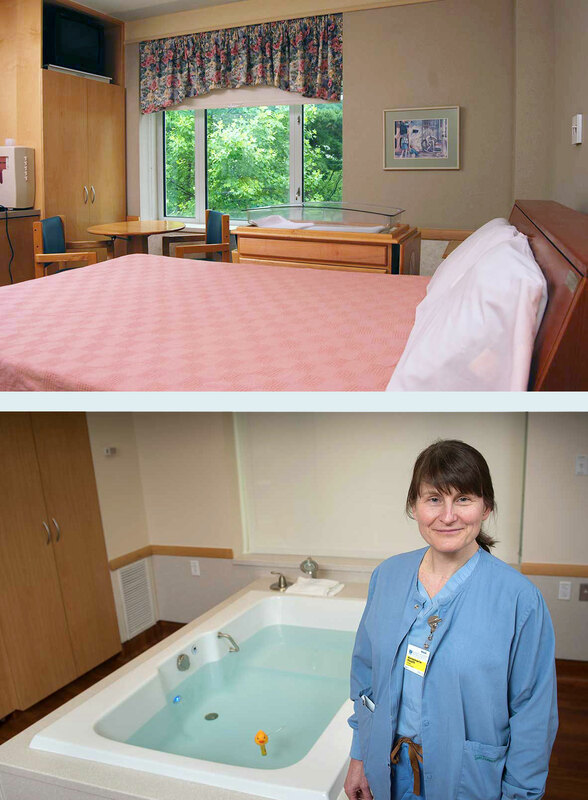 Our birthing rooms are an ideal place for labor and delivery. Each one has a rocking chair, television, CD player, refrigerator and private bathroom with a hydrotherapy shower. Your room also houses all of the advanced technology your medical team will need to take care of you. We’ve combined comfort with peace of mind in a spacious room where you will welcome your baby. In addition, we’ve designed our spacious birthing rooms to accommodate your partner or support person or team, and family members and friends. Rooms offer couches for a partner or spouse to relax. After all, the immediate bonding that takes place after birth is as important to them as it is to you. Our team will support your choices during labor and delivery, including your needs and preferences for pain control hydrotherapy, nitrous oxide, and spinal epidural, among others. 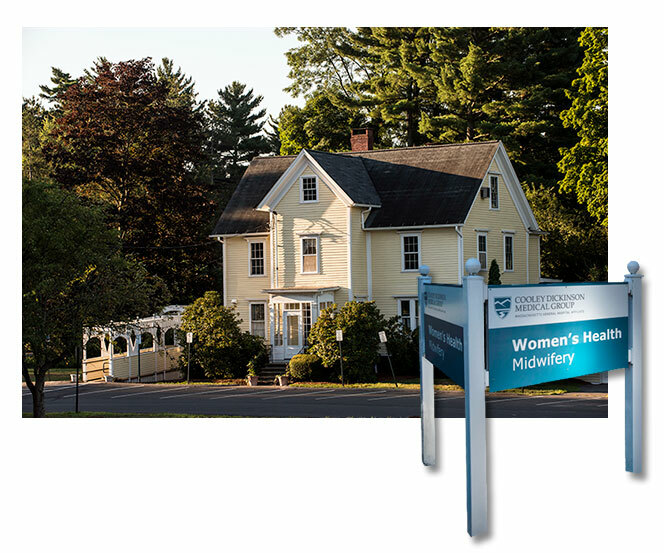 Click Here to arrange to join one of our regularly scheduled tours of the Childbirth Center.